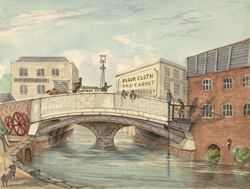 This view shows Deptford Bridge running over the creek. Despite Deptford's reputation as a major industrial centre in the 18th and 19th centuries, the large majority of the families who lived around the creek were poor. Most of the men were unskilled labourers doing seasonal work at the dockyards. Deptford Bridge was the site of a famous battle in 1497, when rebels from Cornwall, led by Michael Joseph, marched to London protesting that their taxes were being used to finance an invasion of Scotland. Having gathered support in Somerset and fought a minor battle in Guildford, Surrey, they were hopeful of finding still more support in Kent. However, they were met at Deptford Bridge by Lord Daubeney and the king's forces, and forced to make a last stand at nearby Blackheath.